We specialise in the design, installation, testing & commissioning of Emergency Lighting Systems. We also supply servicing of Emergency Lighting systems in accordance with Irish Standards (I.S. 3217). 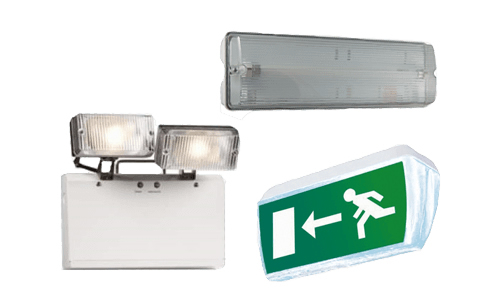 The primary function of the emergency lighting system is to provide the occupants a direct, clear and safe passage of exit from a building when there is loss of electrical supply and the general lighting fails. This will allow an easier and calmer exit from the building, therefore, reducing the possibility of injury to the occupants when evacuating the building. Emergency lighting will also help the occupants of a building who are not familiar with the layout and would otherwise be stranded should there be a loss of electrical supply and the general lighting fails. We are members of RECI (Register of Electrical Contractors of Ireland) and all of our emergency lighting engineers are fully qualified electricians. We will carry out four services per annum in accordance with Irish Standards 3217:2013. We will issue a report after each service which states the work carried out and also any recommendations that the engineer has noted. We are members of RECI (Register of Electrical Contractors of Ireland) and all of our emergency lighting engineers are fully qualified electricians. If you don’t have an emergency lighting system currently in place, we can provide a free survey of your premises free of charge, with no obligation, and issue you with a quotation to design, install, commission and maintain an emergency lighting system in accordance with Irish Standards 3217:2013. Supply & Commission is also available for electrical contractors.